If you are interested in Python developments, take a look at the following clear and easy to read guide. Would you like to know how to send/receive messages and make/answer voice calls? This page provides answers for these questions and gives more information about how to extend your PBX. HTTP API enables you to get information from the PBX in real time and to control calls with HTTP requests. Take a look at how it works through the example of Call command. Call command can be used to initiate a voice call. It makes an API extension call a number and does tasks with the call. The tasks are declared in an OzML response document as seen in Figure 1. Please change the ozekixepbx.ip text to the ip address where the Ozeki Phone System XE is installed. On the yoursite.com the address should be that where the sample applications are running. Using the Apache and Mod_wsgi modul, you are able to run programs (which were written in Python language) in Apache webserver, with these programs you can make outgoing calls, answer incoming ones, and you can also send/receive SMS messages through the Ozeki Phone System XE. You need to have an Apache webserver on your PC. Get more information on how to download and install it from the following step-by-step guide. You can download the installation program of Python from its offical website . Be careful! Install Python Version 32 bit, because Apache is only available in it. The best choice is Python 3.1 since mod_wsgi was made for Python 3.1 32 bit and Apache 2.2 32 bit. Python example projects were made with Python 3.1 32 bit version (download now). Meanwhile installing Python you need to select "Install for all user" option, otherwise mod_wsgi will not work. With Mod_wsgi Apache modul your program (written in Python) can run at Apache webserver. There are two solutions to download Mod_wsgi. You can build it from several sources. You can download the binary files. Download mod_wsgi-win32-ap22py31-3.3.so file. Then rename it to mod_wsgi.so . After the successfull downloading, locate the modul at Apache installation directory, Modules folder. Save the file and restart Apache webserver. Apache needs your permission to reach the folder, and set mod_wsgi modul, so the examples can run through your browser. Then open Apache configuration file (httpd.conf). After opening, search where you can edit Apache access to the folders. Where c:\OpsExample is the path where the downloaded files are found. With these lines you associate .wsgi files to a URL. Concering SendSMS.wsgi, adding a path (in our browser) of /SendSMS, you start the SendSMS.wsgi program. After you have saved the file, restart your Apache webserver. Then, at the registered URL paths, you can reach the Ozeki Phone System XE Python examples. You have to add an API extension, so the examples of Ozeki Phone System XE work properly. You also need the IP address of the PC running the Ozeki Phone System XE and the configured HTTP API port (7780 by default). You need to modify the example Python projects according to these values. Now you need to install an API extension on the Ozeki Phone System XE in order to receive calls and SMS messages. Find out how to install a new API extension. You can receive calls with the ReceiveCall.wsgi Python program. The program gets an HTTP request and sends back an OzML response, with the help of the receiveCall() method. The Delay OzML command in the OzML request indicates a one second delay before the execution of the next OzML command. The Speak command uses text-to-speech to play the given text to the callee. In this example OzML response, the parameters of the HTTP request originating from Ozeki Phone System XE are also used (it contains the current date and the caller ID value). You can create an outgoing call with the CreateCall.wsgi Python program. The program will issue an HTTP request to the Ozeki Phone System XE, which will request an OZML response from the program if the call setup was successfull. You can give informations about the call and the access points of Ozeki Phone System XE in createCall() method. The OZML response requested by the Ozeki Phone System XE is generated by the getOzmlResponse() method. The Delay OzML command in the OzML request indicates a one second delay before the execution of the next OzML command. The Speak command uses text-to-speech to play the given text to the callee. 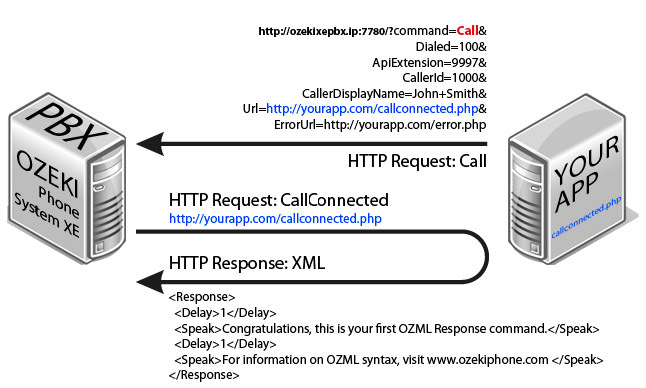 In this example OzML response, the parameters of the HTTP request originating from the Ozeki Phone System XE are also used (it contains the current date and the caller ID value). If the given OZML response is invalid, the Ozeki Phone System XE will issue an HTTP request to the given ErrorUrl, which will be handled by the callErrorOccured() method (the method saves the error message into a new file). You can receive incoming SMS messages with the ReceiveSms.wsgi Python program. The Ozeki Phone System XE will issue an HTTP POST request to the URL registered to ReceiveSms.wsgi. The program receives the HTTP request and saves the information into a new file using the receiveSms() method. The method also sends back a response SMS to the sender, indicating that the SMS has been successfully received. return "Failed to save sms." You can send SMS messages via SendSms.wsgi. The program will send an SMS message (through the given path) to Ozeki Phone System XE. The method SendSms() is responsible for sending out the message. You can also specify the attributes of the message and the location of Ozeki Phone System XE in this method. dict["Message"] = "Test message from Python"
Ozeki Phone System XE will send the delivery report to the url specified by the DeliveryReportURL parameter. SendSms.wsgi handles the incoming delivery report and save the information into a new file, with the help of receiveDeliveryReport() method. The Ozeki Phone System XE offers a lot more options for Python developers. You can interact with existing calls, control and configure the PBX, you can introduce new communication techniques and media formats.